What Is Lunar Eclipse? A lunar eclipse occurs when the moon passes behind the earth so that the earth blocks the sun's rays from striking the moon. This can occur only when the Sun, Earth, and Moon are aligned exactly, or very closely so, with the Earth in the middle. Hence, a lunar eclipse can only occur the night of a full moon. The type and length of an eclipse depend upon the Moon's location relative to its orbital nodes. The most recent total lunar eclipse occurred on June 15, 2011; it was a central eclipse, visible over Europe and south America after sunset, over Africa and most of Asia, and Australia before sunrise. 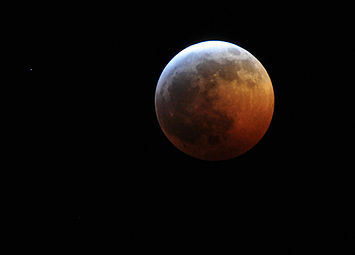 The previous total lunar eclipse occurred on December 21, 2010, at 08:17 UTC. Unlike a solar eclipse, which can only be viewed from a certain relatively small area of the world, a lunar eclipse may be viewed from anywhere on the night side of the Earth. A lunar eclipse lasts for a few hours, whereas a total solar eclipse lasts for only a few minutes at any given place. (article from: http://en.wikipedia.org/wiki/Lunar_eclipse).